What is interesting about this article, besides demonstrating some of the ways technology was beneficial in the Drury School Study, was Ms. Snoddon’s critical discussion of the relationship between ASL Literacy and Technology. I was surprised to read in an article on ASL literacy about literacy as a restricted political political project, and she goes on to directly quote the New London Study (see ABOUT), which laid the foundation for multiliteracies scholarship. She basically argues that the literacy pedagogy is not something that is equally accessible to all students, and it has largely ignored the fact that it is a “socially constructed and socially situated process” (198). It is actually somewhat easy to see how literacy development has left deaf and blind students outside of the traditional educational edifice. This, in my opinion, means that ASL literacy has the revolutionary potential to chip away at traditional literacy paradigms that undemocratically and systematically deny people access to what most take for granted as a necessary tool for successful participation in society at large. It occurred to me early on reading this article, that literacy has been used to exclude people from society for centuries now, however, when excluded groups can be defined racially, socio-economically, culturally, or in other ways, the politicization of these groups obscures acceptance of alternative pedagogies. Basically, everybody should see no problem conforming to what ‘history’ (i.e. the white affluent euro-american cultural project) has defined as ‘literacy’. Perhaps hearing or vision impaired pedagogies have been able to escape this politicization because no one can deny the fact that they must look outside of the traditional pedagogy in order to succeed. Snoddon makes a crucial point when she writes, “ASL texts and the various ways of reading them are the collective social and historical invention of Deaf, ASL-using people,” (198) just as non-traditional literacies are related to the social and historical invention of other excluded groups. Since a democratic and open society must support inclusion of people from culturally diverse social and historical experiences, theoretically it should be open to diverse literacies for expression and participation in that society. Rather than a facilitator of such participation, literacy has often been employed against equal participation. 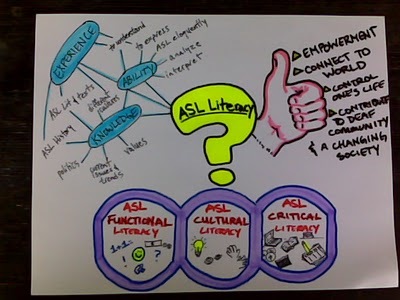 Therefore any progress ASL-literacy can make for greater inclusion and expression via technology and multiliteracies is useful for challenging the 20th century ‘closed’ literacy paradigm on behalf of all excluded peoples. I definitely recommend this article for anyone interested in multiliteracies, in addition to those who are doing pioneering work in the literacy in the ASL-literacy community. This entry was posted on August 6, 2011 at 1:44 pm	and is filed under Critical Perspectives, In the Classroom, Technology, What is Multiliteracy?. Tagged: ASL, critical perspectives, democracy, multiliteracies, technology. You can follow any responses to this entry through the RSS 2.0 feed. You can leave a response, or trackback from your own site.